Oh man, ya’ll…the weekend is over? Can I go back and do it again? Or at least have some more of it? Anyone else feel the same way? Since we’re in the middle of a holding pattern in the kitchen thanks to our renovation (details to come…um, eventually? This thing was supposed to be done months ago…), I wasn’t able to cook at all this weekend (no stove and no sink), but I did cook ahead a few recipes to feature over the next couple of days. 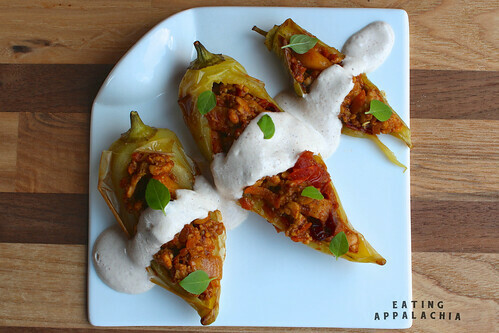 A favorite, which I paired with last week’s horchata, was Ricki’s version of Chiles en Nogada–spiced meat stuffed poblano peppers smothered in walnut (nogada) sauce and topped with pomegranate seeds. A wintery dish, it felt a little out of season, but since I used up the plethora of chiles my sweet banana pepper plant grew these past few weeks, it actually felt quite summery and fresh. And since I’m too lazy to seed a pomegranate (I’m sure it’s worth it but…yes, too much work), I topped the chiles with some vibrant baby basil leaves. Ricki’s picadillo (the spiced meat) is beyond amazing and I’d recommend making it for tacos or burritos or nachos or, well, pretty much anything that you want some meaty deliciousness in. I loved how the tempeh broke down and soaked in all the spices and the sweet crunch of apple and hint of dried fruit (I used a dried berry mixture I had on hand) works really well. Nutty, salty, sweet, and savory, the picadillo hits all the right notes and ties the dish together. As for a creamy walnut sauce, what’s not to love? I went with Ricki’s suggestion of vegan sour cream simply mixed with walnuts, but I’m sure there’s a way to un-process the recipe and make it more natural. If anyone gives it a try, let me know how your recipe turns out! For special occasions or just one tasty weeknight dinner, chiles en nogada are definitely the way to go. Thanks, Ricki, for such a great recipe! Preheat oven to 425 Fahrenheit. Line a baking sheet with parchment paper. Place peppers on the tray and bake until just soft and the skins begin to blister, about 20 minutes. Remove from oven and allow to cool while you prepare the filling. Heat oil in a large frypan over medium heat. Add the onion, garlic, carrots, tempeh, chopped tomato, spices and soy sauce/Bragg’s. Cook until onions are translucent and tempeh begins to brown, about 10 minutes. Pour in 1 cup of the broth, cover, and lower heat to simmer. Cook until all the liquid is absorbed, stirring occasionally, about 15 minutes. Meanwhile, in a small bowl, combine the tomato paste and remaining 1/2 cup vegetable broth until smooth. Add to the tempeh mixture along with the remaining ingredients for the filling; stir well, cover, and simmer for another 5-10 minutes until most of the liquid is absorbed and sauce is very thick. Set aside. Combine all ingredients in a blender and blend until perfectly smooth. Using a sharp knife, slit the peppers lengthwise between the stem and tip, cutting only through the top skin and leaving the bottom intact (leave the stems on as well). Gently pull the pepper open and scoop out the seeds and membrane. Stuff each pepper with filling, dividing it evenly. At this point, you may reheat the peppers until the filling is heated through, or just eat them at room temperature. Spoon the sauce evenly over the peppers, and sprinkle with basil/pomegranate seeds/pretty garnish that you like. Oh, I’m so glad you tried these! And yours look SO beautiful! I really did enjoy them when I made them, too. . What a great idea to use the meat for other purposes, too! Re: the sour cream, I’m pretty sure I made mine from scratch–I’ve never even seen a processed vegan version here in the stores (though most likely because I just wasn’t looking). Thanks for taking this recipe up a notch–now I want to make them again! What an interesting combination of flavours and textures – they sound and look wonderful! Really love the idea of combining tempeh with apples and raisins. And you can’t go wrong with a nutty gravy. Wow, the filling does sound fantastic. And with a walnut sauce to boot. Are banana peppers spicy or mild like bell peppers? Those look delicious! I wonder if mushrooms would work in place of tempeh? I am not a tempeh fan. You know, these guys almost sound…Moroccan? Middle Eastern? I’m not sure, but with all the fruit, the filling kind of feels like a rice pilaf without the rice, of that makes any sense at all. SUPER interesting. They look fantastic Jes! 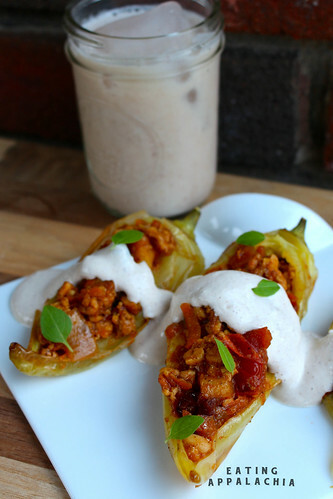 I’m a tempeh convert these days so I reckon I would love these chiles and I always love nut based sauces although I’ve never tried a walnut one before. Always looking for new things to stuff inside the mounds of chilis Mark’s been giving me from his plants every day – this looks delicious! And I bet Mark won’t recognize the tempeh, another plus. These look amazing and filling sounds great. I am going to try to make these but I’m sure I won’t come close to these photos of yours haha!